Property: If you are a mage (wizard), you can use this tome as a spellbook. 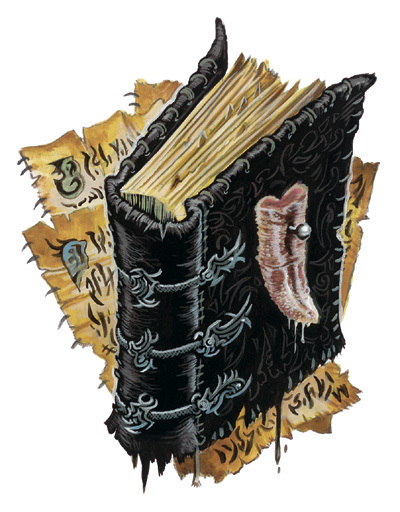 Once per day while you are holding the tome, as an action, you can cast a spell you have written in this tome without expending a spell slot, having to speak, or having to make gestures. You can take another action as part of the same action, but not if it involves casting a spell or activating a magic item. Secret: Vecna watches and keeps tabs on the individual using this tome, and he can write cryptic messages in the book that appear at midnight. Anyone who uses the book ore prepares spells from it learns that a new message is within. After the message is read, it fades away. This thick, leather-­‐bound volume has a desiccated tongue nailed to the front cover. Five of these tomes exist, and it’s not certain which one is the original. The grisly cover decoration on the first tome of the stilled tongue once belonged to a former servant of Vecna who betrayed the lich-­‐god of secrets. The tongues pinned to the covers of the four copies came from spellcasters who also crossed Vecna. The first few pages of each tome are filled with indecipherable scrawls. The remaining pages are blank and pristine.